The challenges of Global Warming are yet to be fully appreciated in relation to their potential impacts on our vulnerable indigenous vegetation communities and the habitat they support for our threatened flora and fauna. One predicted response to the gradual global warming will be a relentless search for tolerant species, suitable for our future landscape and revegetation sites which will be able to adapt to the harsher environmental realities. Fortunately members of the Ice Plant family have a series of rare attributes which will enable them to flourish in these predicted climatic extremes. This article seeks to explore these attributes further as well as highlight some of the fascinating cultural, historic and bush tucker values ascribed to its members. Known botanically as the Aizoaceae, (Latin for "evergreen" or "ever living"), the name reflects the ability of members to maintain green coverage of fleshy foliage whilst existing in the harshest and driest environments. There are over 2,300 succulent, herbs and shrubs in the family from South African, Asian, North and South American with only 60 indigenous Australian species (4 Tasmanian species). Disturbingly already over 20 naturalised South African invaders thrive in Australia's harsher locations suggesting Climate Change may exacerbate their invasive potential. The family is composed of 2 groups, based on the presence or absence of petal-like staminoides (large sterile stamen). The sub family Mesembryanthemoides has showy daisy-like flowers made of these brightly coloured staminoides typically seen in Pig Face Carprobrotus rossii, whilst the other sub family Ruschioides has small insignificant flowers which are brightly coloured on the inside as seen in Tetragonia implexicoma. Like many of the Australian species the Tasmanian representatives act as key framework species in saline wetlands and dry coastal communities. Local examples include the Pittwater and Lauderdale salt marshes as well as the remaining 100 kilometres of undisturbed Tasmanian sandy beaches exclusively vegetated by indigenous flora. From an historic perspective, immense significance can be directly attributed to two of the family's indigenous species Tetragonia implexicoma and T. tetragonoides (many common names apply such as Ice Plant, New Zealand Spinach, Botany Bay Spinach, Warrigal Greens and Cook's Cabbage). It could be considered that these species are held directly responsible for the choice of establishing Australia instead of colonial African nations, as the preferred penal colony. Undeniably many Tasmanians' ancestries would link to this decision. Climate Change's predicted warming, reduction of overland flows and reduced soil moisture will impose severe habitat limitations on our indigenous plants and animals. However, certain plants within families such as the Ice Plants, Native Grasses (Poaceae) and the Cactuses (Cacraceae) will be competitively advantaged and potentially increase their natural ranges. Consequently they will attract attention due to their tolerance and adaptability. An obvious example will be Kangaroo Grass, Themeda triandra, which benefits from a more efficient photosynthetic process (known as a C4 pathway) enabling it to flourish in the dry summer periods when most other competitive grasses withdraw into dormancy. Interestingly, recent observations suggest an increased richness of native grasses on disturbed dark-soil grassy woodland due to their exotic competitor grasses, such as Yorkshire Fog Grass, Holcus lanatus, and Quaking Grass, Briza maxima etc. withering and dying under drought stress. Remarkably, Ice Plants have evolved a separate mechanism to be known as "Night-time breathers" 1 or technically Crassulacean Acid Metabolism (CAM) that will increase the plants adaptive capacity to Climate Change. By storing carbon, in the form of organic acids produced during night time respiration they do not need to absorb carbon dioxide, by opening their stomatal pores. Hence CAM plants stop moisture loses through their pores during the heat of the day. This endows them with added xerophytic abilities that enhance their succulency mechanism to accumulate moisture and halophytic characteristics to survive in highly saline areas. The family members are suitably bestowed with intriguing common names, most relating to their striking attributes which enable them to survive low moisture or high salinity conditions. The name of "Ice Plant" is linked with many family members mostly as a consequence of their leaves being surfaced with salt accumulating bladder-like cells that often sparkle like ice granules to reflect sunlight and reduce transpiration. This name is applied to the fleshy leaved South African Ice Plants (Mesembryanthemum sp. and Lampranthus sp.) as well as previously mentioned species Tetragonia implexicoma. The aptly named "Livingstones" or "Pebbles" [Lithops sp.) and Livingstone Daisy (Doroanthemum bellidiformis) are robustly designed to mimic both the colour patterns and tough surface textures of surrounding stones and pebbles. This ensures survival during arid periods by imparting drought resistance and camouflage from foraging herbivores. During the rainy season when the desert is alive with edible vegetation they transform from their chameleon-like behaviour, into large perfumed boldly coloured daisy-like flowers in an attempt to gain the pollination services of passing insects or butterflies. 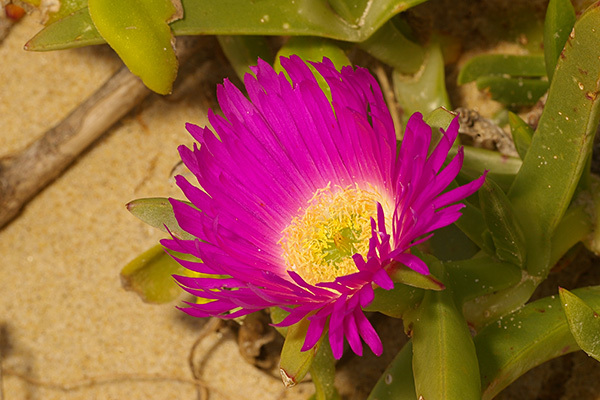 The term "Noon flower" is another popular descriptive name applied to family members such as the Australian Coastal Noon flower Carpobrotus glaucescens, the Tasmanian salt marsh, Round Leaf Noon flower Disphyma crassifolium, as well as the many South African species such as Wiry Noonflower (Psilocaulon tenue), due to their habit of opening attractive blooms around noon and closing later in the afternoon. The resulting pinks, yellows etc carpets are irresistible to their insect pollinators which are at their busiest from noon to the mid afternoon. The less than attractive common name "Snot wort" [Conicosa pugioniformis) relates to this succulent's slimy roots which surprisingly are valued as a South African bush tucker delicacy. As mentioned in the introduction, Ice Plants form an important historic connection with our Tasmanian convict ancestry. This arose as a consequence of the 1768 voyage of Captain Cook to observe the transit of Venus. He satisfied his scurvy-stricken crew's desperate need to savour fresh greens by harvesting the pot herb New Zealand Spinach, Tetragonia tetragonoides from New Zealand's shoreline. Following discovery along the Australia coast by Cook and other explorers, of large swards of both T. tetragonoides and Botany Bay Greens, T. implexicoma, they soon came to rely on these greens as dietary necessities, to enhance their spartan rations. It is interesting to note, if the early explorers and colonists had shown a little appreciation for the Aboriginal way of life, they would soon have selected today's popular bush tucker treats but instead limited their choice to only those indigenous plants that reflected the image of English vegetables. Besides the Ice Plants these included Sea Celery Apium prostratum and Botany Bay Greens Atriplex cinerea. So impressed was Sir Joseph Banks with these Ice Plants, he sent their seeds to Kew Gardens from where it rapidly gained favour in high society cuisine as a summer spinach. In 1779 Bank's fondness for this plant's ability to provide reliable quantities of nutritious greens, was portrayed exuberantly in the House of Common's inquiry delving into the relative suitability of Australia compared to West Africa as a convict-based colony 2. He obviously left a strong impression and the rest is now history. "Pigface" was Tasmania's first bush tucker? 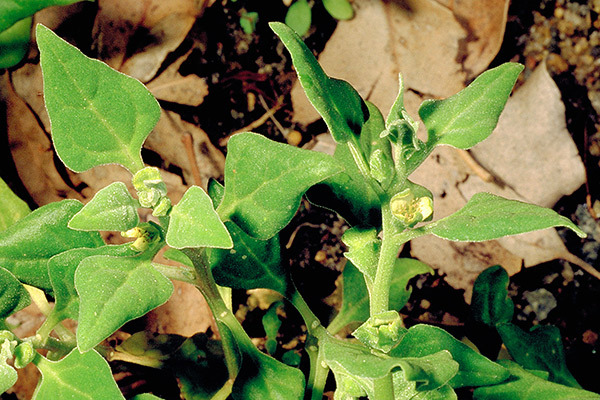 Tasman's voyage of 1642 was not only historically significant as the arrival of the first explorers in Tasmania, but also the collection of 'Greens' (recorded as a Mesembryanthemum sp.) by his crew's shore detachment from the banks of the Boomer Creek flowing into Marion Bay. This collection heralded the start of the current bush tucker bonanza. The collection of what is considered to be Carprobrotus rossii was reported to be "not unlike a certain plant growing at Cabode Bona Esperance (Cape Town)". Many diaries of early explorers and settlers not only record positive entries on the edibility of these "Greens" but also draw attention to the unique strawberry-fig like flavour of the Native Pigface's fruits. During the late 18th century a number of explorers referred to the harvesting of Ice Plants for pot herbage or edible fruits. These included Bligh's 1788 voyage on the Bounty in Adventure Bay, Bruny Island and D'Entrecasteaux's 1793 voyage on the Esperance in Recherche Bay. During this voyage he noted that the fruit proved a delicacy with the New Hollanders (Aborigines) and resembled the Hottentot's Fig of South Africa (Mesembryanthemum edule) except that the flowers were not yellow but reddish purple. Settlers at Collin's first settlement at the "Camp" (Risdon Cove) collected Ice Plants for nutritious "Greens" 3 whilst inland explorer Edward John Eyre partook of Pigface fruits freely noting the ripe fruit was rich, sweet and refreshing in hot weather. 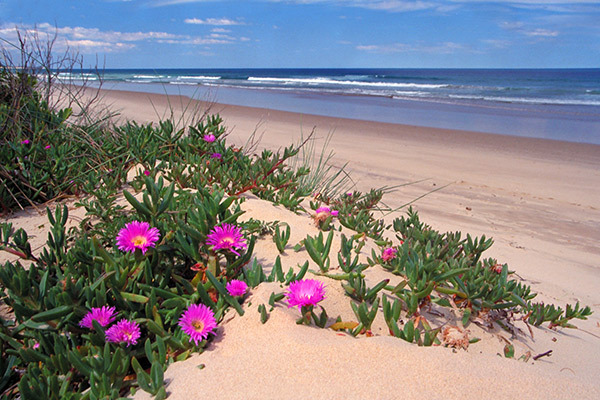 Australia has approximately 25 exotic species recognised as environmental weeds, a number of which derived from naturalising around old settlements, especially near the coast. The Tasmanian weed representatives include Noon Flower Lampranthus glaucus, Heart Leafed Ice Plant Aptenia cordifolia, Common Ice Plant Mesembryanthemum crystallinum and the South African Hottentot Fig or Sour Fig Carpobrotus edulis and the Chilean Pig Face C. aequilaterus. Of these, the later two present major concerns as they are either out-competing the native species or are being inadvertently planted by unaware, enthusiastic bush regenerators. Their ability to release 100's of seeds when triggered by rainy spells from the fleshy fruit or establishes from fresh or even significantly dehydrated cuttings ensures they will remain a persistent threat. Given the recent enthusiasm for planting indigenous Pig Faces, it is important to positively identify the Pig face before planting. Remember, if it has a yellow flower err on the side of caution and check it is not a weedy Sour Fig! It was apparent that explorers and colonists developed a strong desire for the tasty and nutritious green foliage of Tetragonia species. This attraction continued to gain momentum over the next two centuries with these pot herbs being cultivated in European gardens. They have now become an heirloom vegetable, worthy of any menu especially being suited to stir fries, spinach dishes and quiches. Of course, they also prove just as attractive to wildlife; hence protection from browsing is required, during their establishment. Once growing vigorously the wild life grazing can be used to advantage by acting as marsupial pruning shears to limit their rampant growth! It is important to be aware that, like rhubarb and silver beet, it is best not too over indulge in them due to the low levels of oxalates and saponins existing in the succulent leaves and stems. In relation to the luscious fruits of Carprobrotus rossii, local Aboriginals eagerly awaited their summertime ripening. Aboriginal family bands would often establish camp next to broad expanses of fruiting pigface in order to supplement their fish and seafood diets with otherwise distinctly difficult to find harvestable offerings of summer ripening bush tucker. They not only enjoyed the fruits but also cooked leaves of this native Pig Face or at times the Round Leaf Noon flower Disphyma crassifolium to accompany their fire pit-roasted possum, roo or echidnas etc. Beyond their bush tucker attributes, the finger-like leaves and stems when squeezed ooze a gel-like sap which acted as a soothing lotion in much the same way as Aloe vera does today. As an aside these bulky, sappy leaves have proven problematical for all those plant collectors and students who have attempted to use plant presses to dry and press specimens. They are botanist's nightmare! When exploring the world wide range of extraordinary plant uses attributed to Ice Plants, it would be remiss not to mention the captivating mind and mood altering qualities of the South African species known locally as "Kanna" Sceletium tortuosum 4. This mood-altering plant (attributed to the alkaloid "mesembrine") has been used by hunter-gathers and pastoralists from prehistoric times, to elevate mood and decrease anxiety, stress and tension. Amazingly larger doses have no severe adverse affects, as it induces a euphoric state enabling pastoralists to decrease thirst and hunger or for its application as a local anaesthetic and analgesic for tooth extraction. Traditionally prepared by crushing the succulent plant before sun drying prior to chewing, smoking, inhaling as snuff or brewing as a tea, it is an important children sedative and has been effectively used by indigenous healers to withdraw alcoholics from their addiction. Even now the plant may be called onse droe drank - "our dry liquor". Although once widely traded in the South African Cape provenance and stocked in trading stores, inventories of wild plants have dwindled due to over harvesting and habitat destruction. This has sadly resulted in its replacement by alcohol, tobacco and cannabis. It is pleasing to note that, using only cultivated rather than wild harvested materials, currently phyto-pharmaceuticals from Sceletium are being extracted for clinical trials in readiness for the international market. Finally it is worth reflecting on another South African Pig Face look alike known as "Khadi Root" Khadia acutipetala. Its fleshy rootstock provides an alternative yeast source to act as the key fermentation agent in brewing a distinctively flavoured, yet extremely prized beer known as Khadi. As alluded to earlier, the Ice Plant family primarily consists of hardy and environmentally resilient plants. Their tolerance is a consequence of their efficient methods of seed dispersal, ease of propagation from cuttings or off sets, their succulence, pest and disease resistance, fire resistance, xerophytic and halophytic abilities all supported by their CAM metabolism. In light of the global warming impacts, it is predicted that their recent popularity as landscape, erosion control, bush tucker and revegetation species will increase. Disappointingly these competitive advantages will also result in the prevalence of many more exotic members menacing indigenous vegetation communities as invasive weeds. To offset this dilemma, many exotics and native members add a rare three dimensional element to landscapes. This is a consequence of their thick, succulent leaves symbolising shapes of limbs and fingers. They can provide an inspiring contrast with the two-dimensional, flat leaves of the most other plants in the landscape 5. The term night time breathers was referenced from the Royal Tasmanian Botanical Gardens information sheet "The Century Plant". From "Eucryphia", the newsletter of the Australian Plants Society (Tasmania), April 2007.